I can’t believe it’s less than 2 weeks until we get to meet our little one and yet so much to do still! I always have batches of frozen muffins in the freezer for a quick breakfast but I have been trying to get a little ahead. 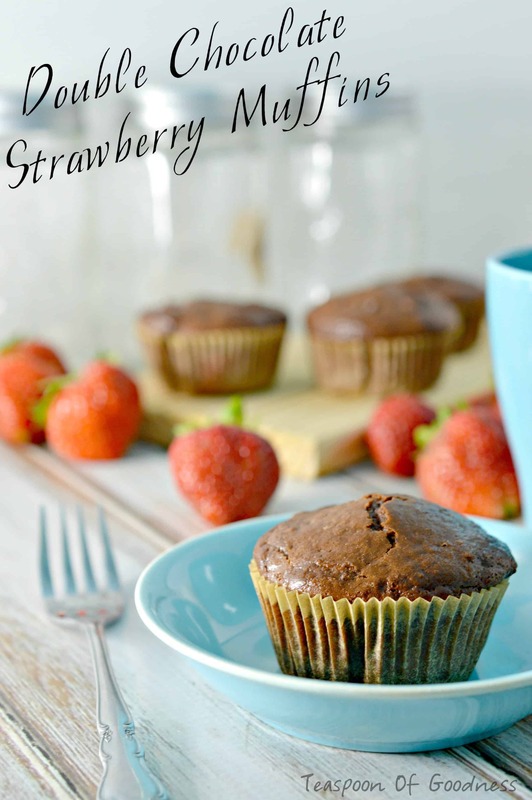 Along with loaves of banana bread, pumpkin bread, french toast casserole, whole wheat apple cinnamon muffins I plan on having several batches of these double chocolate strawberry muffins. Muffins make for a wonderful breakfast on busy days. Let’s face it, with a new little one in the house all days are busy. Not only will we be busy with taking care of our new one but with 3 kids in the house, you know the last one must hit the ground running. We have had some scheduling conflicts this summer which means that the boys have swim lessons, summer, school, VBS and several play dates lined up at the same time Colsen will be joining our house. As you can tell, I will be needing quick breakfast goodies for our oldest 2 boys and whoever will be running them to their activities. The chocolate chip shakes up the muffin flavors in our house and makes my boys think they are getting an extra special treat that day. 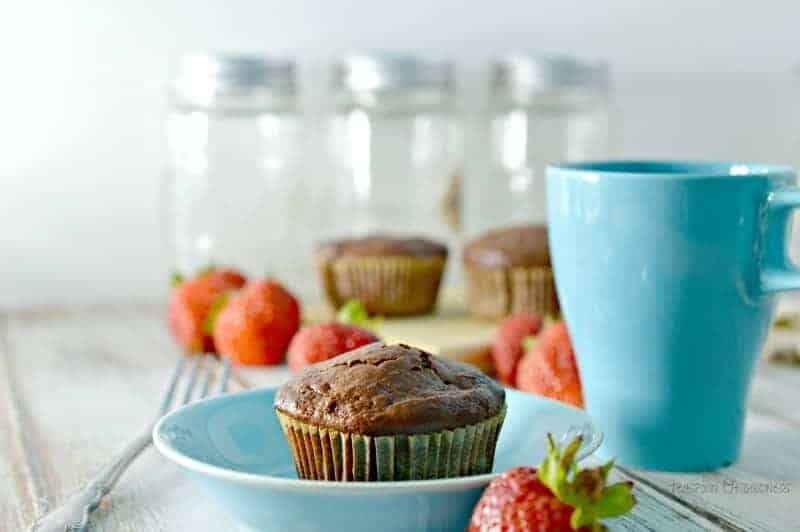 Pair these double chocolate strawberry muffins up quickly with a bacon & egg scramble, or a greek yogurt and you’re good to go! In a large bowl, mix together the flour, sugar, baking powder, cocoa powder and salt. In another bowl, mix the egg, milk, oil, and vanilla. Pour both bowls together and stir until well blended but do not overmix. 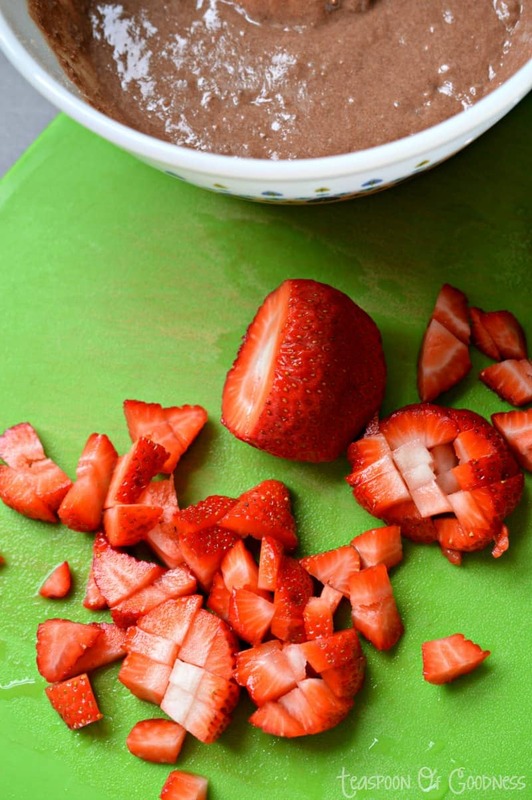 Fold in the strawberries and chocolate chips gently. Cool before removing from the pan. Store any extras not eaten right away in the fridge or in the freezer. What are your favorite quick morning breakfast pairings? 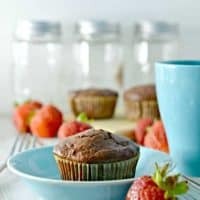 What are your favorite items to pair with muffins?